For us to maintain a dynamic, high-profile geoscience program we need your continuing help. Thank you! 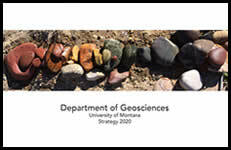 Gifts to the Geosciences department are administered by the University of Montana Foundation. Please review the donation choices below and choose one when filling out the secure form below. If you would like to donate by mail please download our form.